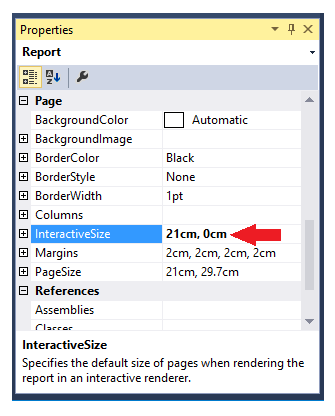 Using visual studio left click just under design to focus on the report. Now the report properties window should be visible in the bottom right of the screen. Set the interactive height to 0 as shown below. You will get the following warning sign below. Limiting the report to one page, by setting the interactive height to zero, means everything needs to be loaded all at once. This will create lag when a user loads the report and interacts with it. If you are basically using SSRS as a means for end users to pull a data dump via excel, heed this warning. If you just have a few aggregated tables and you want them all on the same page you should be fine.